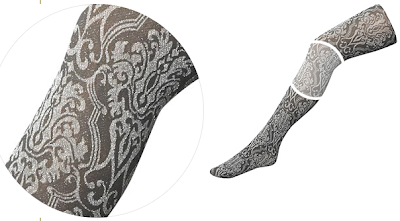 Whilst browsing the polyvore pages I spotted these uber cool metallic damask print tights. Sadly they are from Oasis, a european store which, as far as I can tell, doesn't offer its goods to the USA. So I began searching everywhere I could think of to find, if not the same, than an equally awesome pair I could get here. At Anthropologie they have a pair that is very subdued as prints go, a black opaque tight with a black design that is equally spaced around the leg in quadrants. They are $18. Emilio Cavallini has a pair called the Damask Boudior Tights, which I prefer to the Anthro ones because of their bold, contrasty, all over design. They come in both red and black, and are $22. Ebay has these leggings, which are rather unimpressive, but I'm including them because I found so few options. And that's it! That's all I could find after checking F21, Urban Outfitters, ModCloth, Free People, Hue, and a bunch of others. So if anyone knows where I can get the awesome metallic damask tights, I'd love to know! I'll keep an eye out for you. How did I never think to put that pattern on that item? ?